Your private tour kicks off with a view of the Atlas Mountains as we snake through the Tizi-n-Tichka pass to the Unesco World Heritage site of Ait Ben Haddou, famous on the big screen for movies like the Gladiator and the famous HBO series Game of Thrones. We’ll then continue to Ouarzazatte to visit Atlas Film Studios and a Kasbah located in the city and later towards valley of Roses, famous for its annual Festival of roses. Then, we’ll drive to Dades Gorges where we spend this night in a hotel with a complimentary dinner and breakfast. Here, we’ll continue our tour by 4x4 and visit to Todra Gorge, a colorful narrow canyon famous to outdoor lovers. Then we’ll drive through The Ziz Valley to reach Erfoud, an oasis town known as the gate to the Sahara desert and recognized for its unique fossils. There we can visit a local factory which produces artisans and house decor made from fossils, there is also a local shop where you may purchase such items as souvenirs. From there we’ll continue to Rissani, where we’ll visit the local souk and then drive towards the desert to reach Merzouga. Arriving at a checkpoint we leave the vehicle and begin our camel ride into the desert dunes, accompanied by experienced guides, arriving at the Merzouga Desert Camp where we’ll stay overnight in Berbere tents. This spectacular night will be rendered unforgettable with a unique and traditional starlit Berbere dinner topped off by tribal music around a desert campfire. 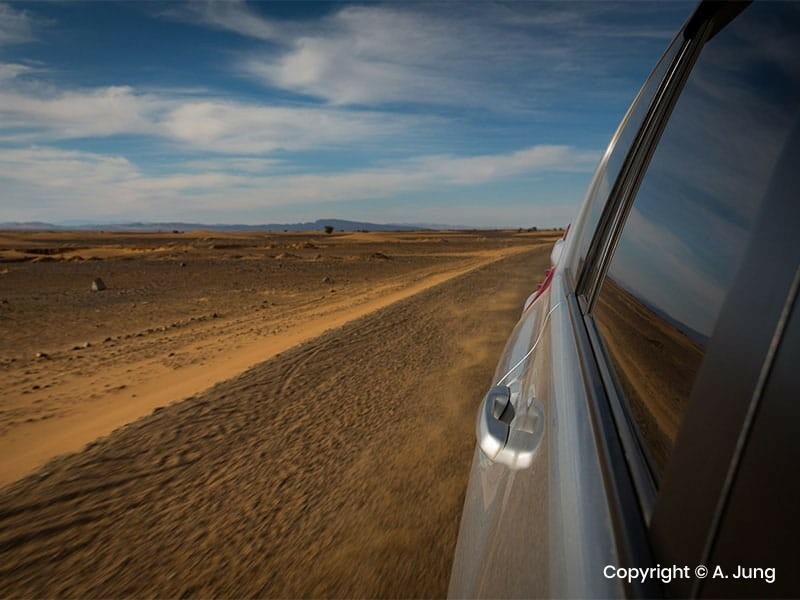 This day will be spent exploring the Merzouga desert. 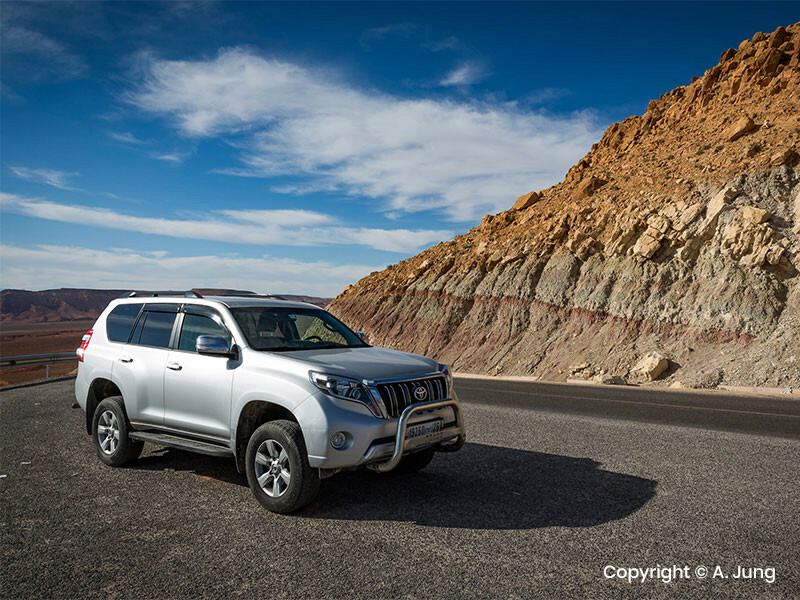 You’ll get a chance to “do your own thing”, with the option of camel trekking, or exploring via the comfort of a 4x4. We’ll also visit the Khamlia village famous for its traditional music. We simply can’t miss the opportunity of appreciating the sunset behind the dunes of the bewildering Sahara desert. 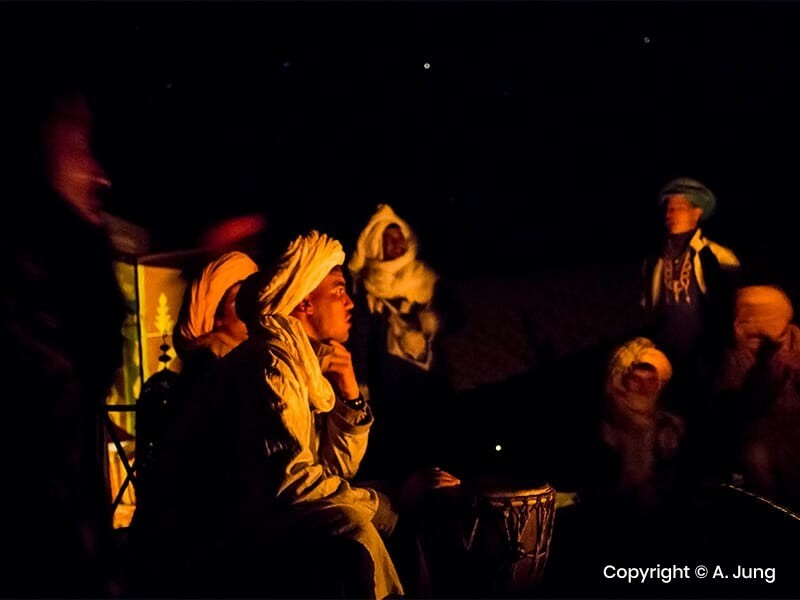 Our night will be topped off with local music and traditional Berber food around a campfire. After fetching an early start to watch the sunrise in the desert, we’ll ride camelback to a nearby local hotel where you’ll get a chance to freshen up. After breakfast, at the hotel, we’ll drive through Rissani and Erfoud until we reach Midelt in Atlas Mountains. There, we can stop for lunch before driving to Fes where we’ll stay overnight in local hotel. We’ll start the day exploring the oldest city in Morocco, snaking through its alleys and narrow streets. Fes consists of three distinct parts; Fes el Bali (a UNESCO World Heritage Site) being the oldest of the three with more than 9000 narrow streets and alleys fortified by a large wall, Fes-Jdid “new Fez” (home of the Jewish quarter) and the “Ville Nouvelle”, the newest sector of Fez created during the French occupation. Later in the day we’ll drive to Rabat and then Casablanca. 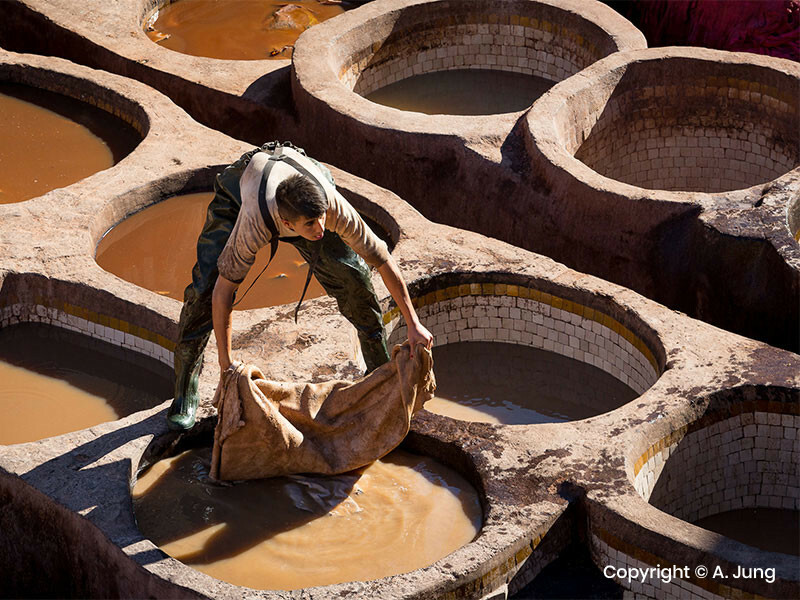 We’ll also visit the Tanneries, the Attarine museum and the Moulay Idriss mausoleum. 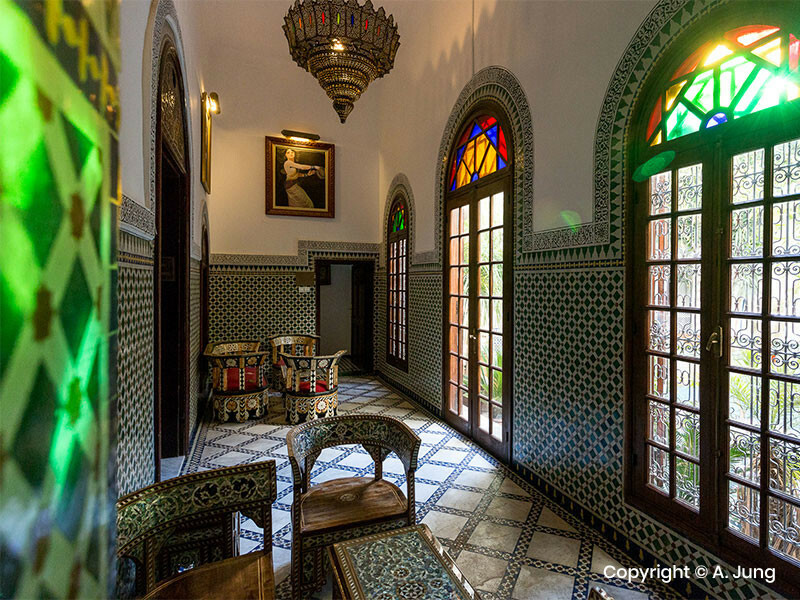 After lunch you’ll visit many different cooperatives and then, experience a wonderful panoramic view over the whole Medina of Fes before driving to Casablanca where we’ll spend the night. 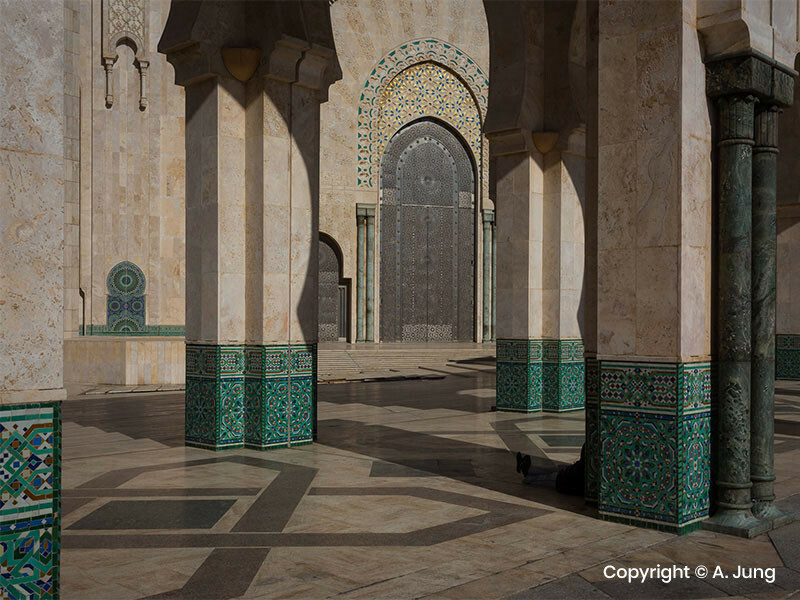 Today we visit the main attractions and monuments of Casablanca, including Hassan II Mosque, before ending our tour in Marrakesh. Entry fees to monuments / museums. Check out the prices for your private Moroccan tour with Holiday Tours In Morocco. To know the price range for groups larger than 4 please contact us. To know difference between budget, standard and high class accommodation, please visit our Accommodation in Morocco page. More info about terms and conditions on our FAQ page.